A clue to the quality of Shockwave’s boats hits the eye on entering their workshop (calling it a factory would hardly do it justice; perhaps studio would be a better word). The team responsible for the fibreglass work averages better than 30 years in the business and they clearly still have their enthusiasm. Working on boats that are unquestionably custom projects, with little in common beyond the basic hull, helps maintain it. Shockwave Powercats wanted a local rather than exotic name for their range of leisure craft and settled on Breaksea, after the cod of that name - better known as the black a--- snapper. 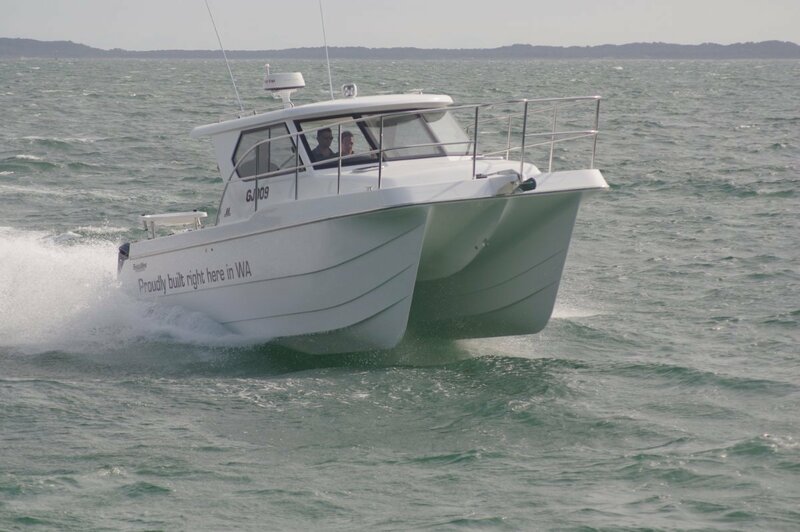 The review boat, the Breaksea Nine Metre, is based on the same hull as that used for four WA sea rescue boats supplied over the past three years. 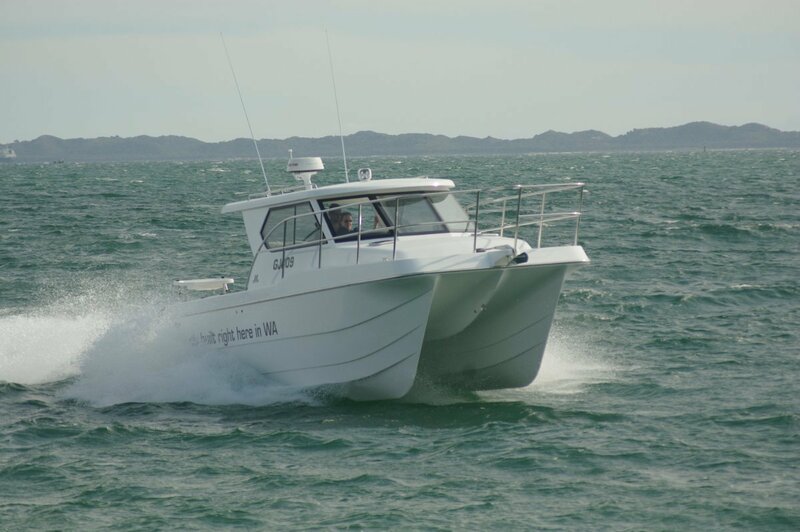 These boats have chalked up 6,000 heavy duty running hours between them, the equivalent of more than 20 years of typical leisure use per boat, and are still in virtually new condition. There is no such animal as a standard Breaksea; every boat is built to order (using the resin infused technique) and reflects the exact requirements – not to mention dreams – of its owner. A large percentage of each boat beyond the hull is produced from unique moulds. At the completion of their one-off use they are destroyed. Now that is custom work. 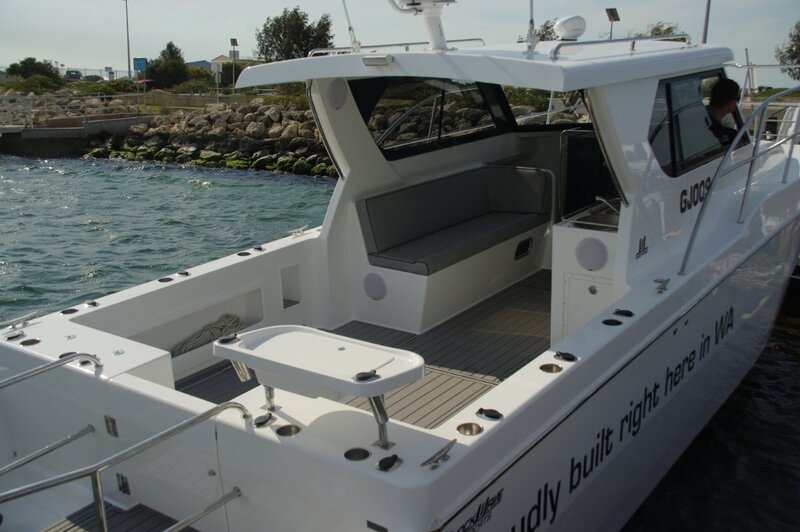 The review boat combines abundant deck space with weekending ability. The fundamentals of basic galley, fridge, fresh water deck shower and enclosed full height flushing toilet combine with comfortable sleeping accommodation for three: a double across the bridging structure right forward and a single in the port hull. These are the permanent berths; the sofa-sunbed opposite the helm is the part time fourth berth. The typical boat in this class gets a double seat at the wheel, but this splits the party on board. The Breaksea’s arrangement lets everybody join the conversation group. Fishermen have access to a lot of rail plus the between-motors boarding platform. They also have a magnificent bait station, abundant rod holders and two 400 litre holding tanks (or dry storage). As far as possible the builder used Australian, preferably Western Australian, products in the fit out. Batteries and Ultralon deck sheathing are examples of this. There are two starting batteries and one 125A house battery. The latter has the capacity of two and saved 80kg by replacing a pair with one. Adjacent to the battery box is a locker containing all major switches. On water behavior and performance brought up no surprises. The vigorous and well established sea breeze would have given most boats something to think about but we had it well under control. At speed we threw out plenty of spray, almost none of which made it aboard and cut through, more than over, a healthy proportion of the seas for a comfortable ride. At saner speeds all was serene. At rest, unsurprisingly, we had the stability of a wharf, which would have allowed large numbers of anglers to fish from wherever they chose. Towing a 30ft catamaran might seem an unlikely proposition but it is certainly possible, as it was for us on the review day. Just a matter of a tailored trailer and a towing vehicle that can handle the load; launch and recovery was utterly straightforward. With 800 litres of fuel feeding the twin 250hp Yamahas the likes of the Kimberley beckon.